Whether it’s for your next camping trip, any everyday carry to keep around the house, or for your job, having a great flashlight is important. That’s why we set out to find the best flashlights made in the USA. Check out our top recommendations, extensive details about each of our picks, and our research methodology below. We found only two high quality American manufacturers of flashlights: Maglite and SureFire. However, choosing between those two companies is fine with us – they each have a diverse set of amazing flashlights. From the heavy duty D-battery flashlights with the old school incandescent bulbs to the latest and greatest tactical LED flashlights, we found several awesome products that can stand up to any flashlight on the market. More on our top picks below. Check out more about our top recommendations: extensive product details, what we liked, what we didn’t like, and where to get them. The Maglite Mag-Tac LED flashlight is a total bear when it comes to flashlights. This model was designed with input from numerous military and law enforcement personnel (and it’s certified by the National Tactical Officers Association), so you know it has all the features they need. It’s built to withstand the elements with a weather resistant seal and a protective layer from the inside out that helps prevent corrosion. The Quick-Click switch on the back of the flashlight provides easy access and a few different modes to choose from – momentary, full power, and strobe (which can help distract potential attackers).The Mag-Tac is also drop resistant. It comes with a removable clip so you can hang it on your belt for easy access, and a couple of lithium CR-123 batteries. Beam distance is roughly 633 feet and it lasts for 4 hours on full power. The SureFire Titan Plus packs a lot of power for such a small flashlight. At full power, it reaches 300 lumens (it also has settings for 75 and 15 lumens). At 15 lumens, it can last up to 7 hours. The full power setting drains the battery much quicker, lasting a little over an hour. The light beam that the Titan Plus produces is very wide and evenly distributed (they call it the MaxVision beam). This flashlight is super durable and very weather resistant – if you drop it, it’s not going to break like some other cheap flashlights. It also comes with a removable pocket clip for easy access on your belt, and a loop on the back so you can attach it to your keychain. The Titan Plus is powered by a rechargeable AAA NiMH battery (charger not included unfortunately). 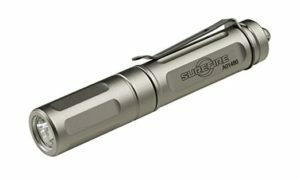 Overall, the SureFire Titan Plus is a great compact, everyday carry flashlight. 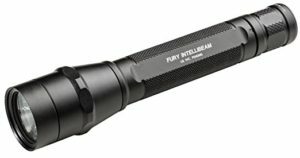 The P3X Fury from SureFire is the brightest flashlight we’ve ever seen, and easily beat the competition in our research. 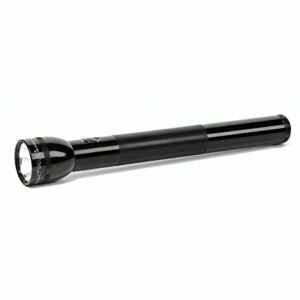 The max output on this LED flashlight is 1,000 lumens, powered by SureFire’s IntelliBeam technology. Your first click of the button (on the tail of the flashlight) gives you an auto-adjusting mode (hence where the word “IntelliBeam” came from), and subsequent clicks will get you to the 1,000 lumens max output mode, then lower modes from there. The body of the flashlight is very durable, made of aerospace aluminum, and the entire flashlight is built to withstand high impacts and varying weather conditions. 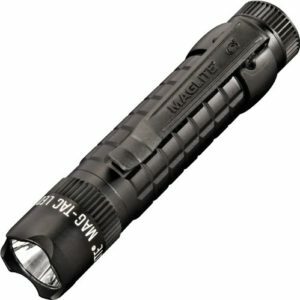 Maglite is synonymous with quality American craftsmanship, and their Heavy Duty Incandescent 4-Cell flashlight doesn’t disappoint. This flashlight is a beast, at 15 inches long and weighing in at almost a pound. This is a great flashlight to keep around the house or store in your vehicle. It’s weather resistant and anodized from the inside out to prevent corrosion. The adjustable head can turn the beam from spot to flood in just 1/2 of a full turn, and the beam is plenty bright at 98 lumens. This flashlight should be a staple of every household. Keep in mind, 4 D batteries are required and not included. Without a strong beam, your flashlight is essentially worthless. We considered two types of beams: incandescent and LED. Incandescent is your more traditional variety that you see in a lot of older models. It works plenty well, but typically has a lower max output than LED. LED lights have a wide range of light outputs, ranging anywhere from 10 lumens all the way up to north of 1,000 lumens. We also wanted to make sure that the flashlights we chose had a a wide and even beam output – some cheaper flashlights can be inconsistent. And lastly, we looked for flashlights that had a variety of output settings – not only in terms of beam strength, but also width (spot vs. flood lighting). Your flashlight needs to be easy to operate, especially in a high pressure situation. We primarily chose flashlights that clicked on from the tail of the flashlight, which is much easier to operate, especially if your other hand is holding something else. We also really liked flashlights that are easy to carry, so a pocket clip was a nice addition to many products we looked at. Power consumption and battery usage is crucial when you’re looking for a reliable flashlight. All of the products we chose have at least 4 hours of power at their lowest setting. We want to make sure that you’re getting the best flashlight for your money. After all, we’re consumers too! We eliminated several flashlights from our consideration that didn’t meet our quality standards for the price they were offering.